Dimensions 391'9" by 52'2" by 11'10"
Because of the ship's frequent sailings in waters close to Japan, she was clandestinely fitted out with electronic equipment and used to closely monitor Japanese naval maneuvers throughout the early 1930s. This was known as Operation GOLD STAR and returned considerable intelligence. 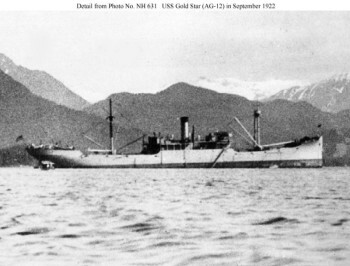 Gold Star was at Dumanguilas Bay when war broke out. Following the loss of the Philippines, Gold Star operated out of Australian ports as a coastal steamer.